Today marks the thirtieth anniversary of the release of Born in the USA, Bruce Springsteen’s bestselling album that catapulted an already acclaimed rock star to global icon status. He, along with the ever-faithful E Street Band, went from playing the clubs and smaller, auditorium venues to filling stadiums night after night after night after night. The wiry, stocking cap-clad, guitar-playing hipster-type suddenly bulked up, donned the everyman fashion of the 1980s, danced with Courtney Cox (long, annoyed sigh from this author), and left an indelible mark on the ethos of that decadent decade. the first kick I took is when I hit the ground. diehard listeners knew that no matter what the music videos portrayed, Bruce had not lost his capacity for prophetically naming the social and economic injustices people faced in the United States. No matter how Ronald Reagan wanted to misuse the lyrics in his 1984 presidential race and no matter how many times the song continues to be misrepresented as some sort of blind patriotic anthem at sporting events, Born in the USA—song and album–is a lamentation of the Baby Boomer generation—that generation “lost in space,” sold out by its leaders to Vietnam and Watergate and who sold itself out to the empty promises of the American dream and consumerism. Each song is, in some way, a story of lament, wrapped in Bruce’s ambivalence towards participating in the American political, social and economic culture of the 1980s. This ambivalence should rub off on the listeners and leave us vaguely confused as we raucously dance to the album’s many upbeat, rockin’ tunes. But if we don’t pay attention, we can miss the sad reality that “Glory Days” is really about a high school sell out sitting in a bar, missing his youth. Or, as the Courtney Cox music video exemplifies (another long, annoyed sigh from author), we can miss the aching loneliness and yearning at the heart of “Dancin’ in the Dark.” This is why it is valuable to listen to Bruce’s live renditions of these iconic hits. (See this example of an acoustic “No Surrender” performed in Toronto circa 1984). I’m sure many of us are able to identify certain albums or musical moments in our past that we recognize to be critically formative. 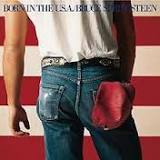 Born in the USA is one of those albums for me. It is even more formative than (dare I say it?) Paul Simon’s 1985 Graceland. This has a lot to do with the important family lore that resides around that old worn out LP of Born in the USA still resting front and center in my Dad’s record collection. Allow me, if you will, to be a bit self-indulgent and autobiographical in this post. I’m not basing this on the many articles and books I’ve read about Bruce nor am I going to give Born in the USA the in-depth, social ethics analysis it so richly deserves. Following Bruce’s own style, this post contains pieces of a story. While my theological reflection may seem tenuous at best, I offer this as a personal testimony to the ways in which Bruce’s body of work has formed my theological and sacramental imagination, as it has many theologians and Catholic commentators like Thomas Massaro, SJ, Dr. Roberto Goizueta, Dr. Christopher Fuller, and Andrew Greeley, just to name a few. I was exactly 51 weeks (exactly 358 days) old when Born in the USA was released. We lived in the little wheat farming and cattle ranch community of Condon, OR, my Dad’s hometown. Population about 700, Condon sits about 150 miles southeast of Portland on the Columbia River Plateau. There has never been a record store in Condon and back in those days, of course, one could not just download the newest hits on iTunes. My mother, three months pregnant with my little sister, drove into Portland for a doctor’s appointment. Before beginning the 3.5 hour drive back up I-84E along the Columbia River Gorge, she stopped at Music Millennium, a famous record store in Portland, and asked if they had the new Bruce Springsteen album. The cashier shook his head and told her it wasn’t on the shelves yet. Mom pleaded with him, explaining how she lived in the middle of nowhere and would not be back to Portland for a while. Sympathetic to her plight, the man went in the back and brought back a large, unopened box containing numerous copies of the hit album. He then handed her what we Greiners believe to be the first copy of Born in the USA sold in Portland, Oregon. My parents were in their late twenties when Born in the USA came out and it was an album for their generation. They had lots of friends who spent many fun nights gathered in my parents’ living room around the record player. They played records over and over. My parents were the only people of the group with kids. My sister and I were, we are told, quite the hit. I vaguely remember entertaining these friends by dancing around in my footy pajamas, microphone in hand, Born in the USA blasting through the speakers. And I clearly remember begging my Dad to play it over and over when it was just us hanging out at the house. As I continuously listened intently to every beat and every word, the sounds and lyrics took a strong hold on me. Just ask my 29-year-old, beloved teddy bear I affectionately named Bruce. But there was a time when I disliked Born in the USA, again, for lack of understanding. By the time I was 16 and attending my first live Springsteen show, my Springsteen repertoire had expanded. I snobbishly turned up my nose to anyone who said Born in the USA was his or her favorite Springsteen album. I, of course, claimed the seemingly more angst-ridden-less-sell-out- Darkness on the Edge of Town. Yet this turn away from that formative album did not keep me from spontaneously jumping up and down ecstatically when the band ripped into “Darlington County” followed by “Workin’ on the Highway.” And I admit tearing up and clenching my hands as if in deep prayer when they performed a haunting rendition of “My Hometown.” I found myself realizing and appreciating the depth of Born in the USA in a way I had not experienced before. Suddenly the lyrics made sense. This was not a sell-out album, no matter how tight Bruce’s jeans were or how wild and big the crowds got or how ridiculous Nils looked in those giant hats or how many politicians misused the songs for their own gain. This was an album full of stories about people experiencing deep loss, regret, pain, and confusion and not knowing what to do next. In college I claimed the album again, this time in the name of my new-found commitment to social justice and Catholic Social Teaching. The ache of lamentation present in these twelve songs remains relevant for me today—especially as I have experienced some of that social ambivalence Bruce grapples with in each song. But I also find myself dancing in my chair as I write this, still caught up in the romance and the hope palpable in the music. Perhaps it was this romance and hope that captured my imagination as a little girl and sparked something within me. If that’s the case, I’m living proof that a thirty-year relationship with an album like Born in the USA can produce just enough of a spark to light a lifelong fire. So keep dancing Courtney Cox–even if we are still just dancing in the dark. Unexpectedly and mysteriously, I find myself crying. I’m truly not sure why, but let me assure you, I loved reading this post. It is moving, so some of the tears are for this I think, to consider you and your younger-than-me parents in this scenario. I am also reminded of the mystical Body of Christ, how we are all woven together, even if our paths seeming never cross… or when they do cross, we don’t always expect the connections to emerge. Gosh, that makes me sound more cynical than I am, but the vast mystery of it touches me. Of course, I prayed for Kevin Ahearn as newly-returned-to-church Catholic, never seeing or knowing him,and honestly forgetting all about him in the ensuing years. Then the shock of encountering him as an adult and theologian today. That story and the Springsteen connection are different – yet the same. In 1975 I went off to college armed with the then brand new album, Born to Run. Growing up in the NYC area, I had already heard of the local artist that was about to hit the national scene and I loved his music. I saw my first Bruce show in December of that year, 6 hours of music for $3! I saw my last Bruce show about one month ago, 3 hours of music for $110! The thing is, last month, all I could think about was the catholicity of the what I was experiencing. Maybe that is why the tears today, the depth of something I was pondering that night. I don’t know. And of course, the dissonance of lament and dancing, which is very catholic and Catholic – and so much a part of all life. If we let it be so. Sorry for this ramble of a comment. I’m not rereading it, so my words may not even make sense, or get to any point. Clearly you touched me, for which I thank God, and I thank you. Wow Fran. Thank you for your words. I’m glad this post touched you. and let me assure you, I can’t even get at ticket to my favorite Bruce cover band for $3. So jealous! Thanks again for your words, especially about being woven together in the Body of Christ. I think you’re on to something there. Wonderful post. What a great tribute to a great album that came to me during high school in the late 80s, when I was in the thick of “experiencing deep loss, regret, pain, and confusion and not knowing what to do next.” I’ve listened to this album countless times, and now my 4-year old asks me almost every time we get in the car to play “Born in USA”. He has no idea what it’s all about, but I’m sure that will come to him over time as he discovers disappointment and struggle. May it drive him to an active effort for justice in a world gone awry. Thank you Jason! I am glad that this post spoke to your experience so well.